Hello everyone! New SCAPE member here. I have kept a lot of saltwater/nano reef tanks in the past, but I'm very green (pun intended) when it comes to planted tanks. 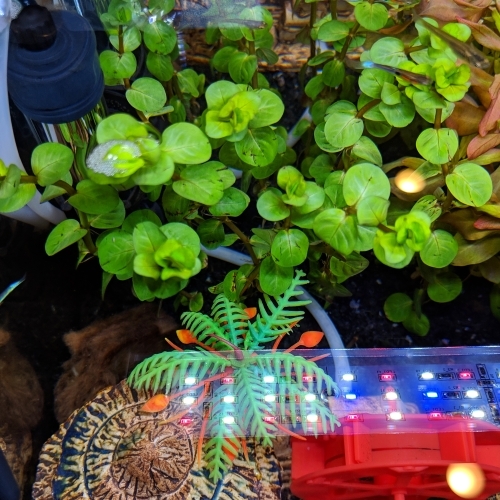 I actually wanted to start a betta tank as a cool project to work on with my young son, so I bought a 5 gallon tank from Tong's with very basic equipment for that purpose. Turns out my son has zero interest in bettas (said they are too mean) and wanted guppies instead. So despite already having set-up the betta tank with almost no plants, I started to convert it into a very basic planted tank to house endler guppies. 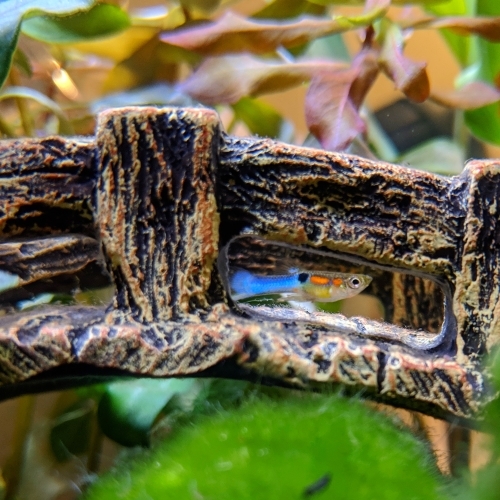 While researching planted tanks and endlers, I came across SCAPE. I'm learning a lot through this forum, and I hope to go to SCAPE events with my son to learn more and meet other fw tank enthusiasts. Here's my basic (very low-tech) set-up. This is the only tank that I have at the moment. My son is totally into it, so it's been a great experience so far. 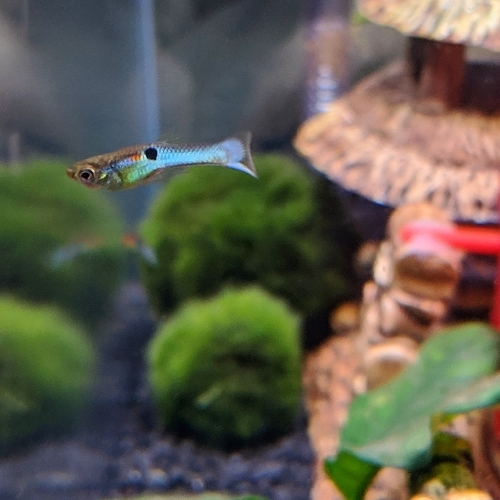 My son insisted on getting a blue fish, so it houses Japan Blue Endlers shipped from LiveFins in Florida. 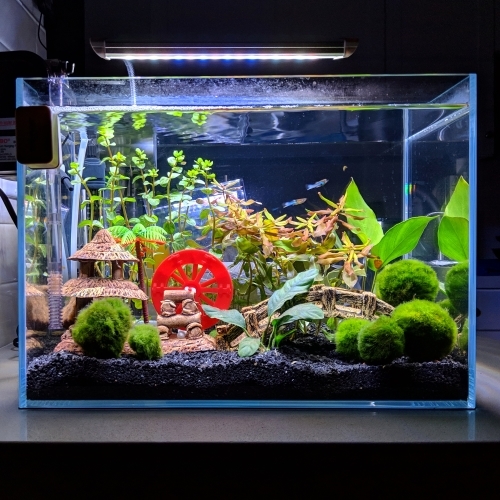 Hoping to eventually add some kind of plant/moss for the Endler fry and also a few Painted Fire Red Cherry Shrimp. Looking forward to seeing you at the meetings! Looks great! What plants are those? Nice welcome man love to see the shrimp add to that! Thank you! I'll be at the meeting on the 23rd with my son. Looking forward to it. Thanks! Will check out SCAPE's IG. Welcome! I'm from Irvine too. Let me know if you need anything! Welcome! Awesome looking aquascape, very nice. Nice! Thank you for the offer! Crazy how we don't have a single LFS in Irvine. Thanks! I was cringing when my son chose the decorations, but they ended up looking decent overall I drew the line when he tried to pick the light blue gravel though. Welcome. Very nice tank. I like it. That's an adorable tank So nice that your son is enjoying the hobby with you. Haha. Very true. I think I've had the one with both light and dark blue mixed together as well. Thanks! He is definitely enjoying the tank, but I think it still comes second to his toy trains and cars. Yeah, its insane. Tongs is the nearest. But 405 tropical fish is more affordable. Oceans in aliso is awesome as well! I'll have to check out Oceans. I went to 405 this past weekend based on some posts on here, and noticed that the tank with the cherry shrimp was FULL of long white flatworms. Maybe that's normal (? ), but I was pretty disgusted. But they do seem to have a great selection and at reasonable prices. Monday afternoons is the day to go to 405. Tanks look better. Also drop by sand bar when you visit Oceans. There tanks are super clean.